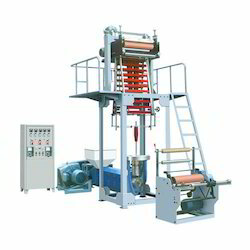 Prominent & Leading Manufacturer from Ahmedabad, we offer film blowing machine. We have complete allegiance in developing modern day Film Blowing Machine. We bring forth the most economic model for good quality film. The offered machine is equipped with special screw design, which makes it suitable for colored and transparent film mixing. Featuring industry compliant manufacturing and high performing components the offered machine is accessible in 40 mm to 100 mm range of extrusion plant. Further, we are providing this machine in latest specifications at a competitive price.